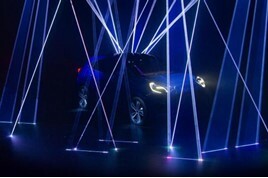 Ford announced the return of the Puma and unveiled its new Kuga SUV at a ‘Go Further’ showcase event outlining its plans to introduce a range of hybrid, plug-in hybrid and pure electric vehicles (EVs). 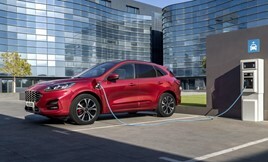 The all-new Kuga SUV will be first Ford to feature mild-, full- and plug-in hybrid (PHEV) powertrains, the Puma will return to the Ford line-up as an SUV-inspired crossover later this year and the Focus and Fiesta will soon be available with a 48v mild hybrid drivetrain as part of its product plan. A “Mustang-inspired all-electric performance SUV” is set to arrive in 2020, meanwhile, offering a 370 mile WLTP range, the brand said. Ford’s electrification plans are not confined to its passenger cars, with a new all-electric Transit anticipated to launch in 2021 and the new Tourneo Custom Plug-In Hybrid set to drive the agenda on cleaner towns and cities by matching the Kuga plug-in’s claim of offering a zero emissions range of over 31 miles per charge. 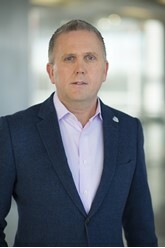 Stuart Rowley, president, Ford of Europe, said: “Forward-looking, technologically advanced and using a wide range of electrified solutions to suit the different needs of different consumers, our new Ford Hybrid vehicles will make electrification relevant and affordable for more drivers than ever before. “The models introduced today are just the start of our plans to develop a comprehensive line-up of smart vehicles for a smart world. 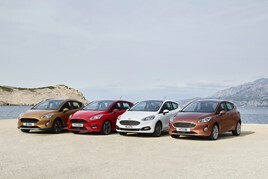 Earlier this year, Ford announced that every one of the company’s nameplates launched from the all-new Focus onwards will include an electrified option, featuring either one of, or a combination of, mild-hybrid, full-hybrid, plug-in hybrid or full battery electric options. In the forthcoming Fiesta and Focus hybrids a mild hybrid system will feature electric torque assistance from a ‘Belt Integrated Starter/Generator’ to deliver greater power, responsiveness and fuel-efficiency, Ford said. The new Kuga Plug-In Hybrid combines combustion engine, mains-chargeable battery and electric motor for greater fuel-efficiency and zero-emissions driving capability. 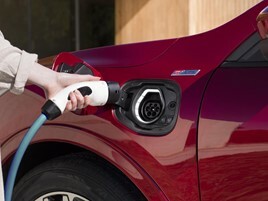 Ford's EV plans will also usher-in next-generation connectivity to facilitate over-the-air updates and be at the forefront of efforts to improve Europe’s charge point infrastructure. Ford is a founder member of the IONITY consortium that aims to build 400 fast-charging (350kW) stations in key European locations by 2020. The devices will allow 100-miles of charge to be added in just 10 minutes. Ford will also partner with NewMotion to provide a one-stop-shop for charging, using NewMotion's charging network, which covers more than 100,000 charging points in 28 countries across Europe. 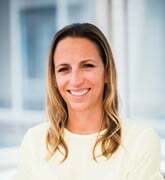 The brand has also commissioned its own smart wall-box solution and will partner with major energy companies to give customers access to specialist electric-vehicle tariffs and installation services. The new Ford Kuga will go on sale later this year and will be offered with the option of a plug-in hybrid drivetrain which combines a 2.5-litre petrol engine and 14.4 kWh lithium-ion battery to deliver 225PS. A pure-electric driving range in excess of 31 miles and anticipated 235mpg fuel efficiency and 29 g/km CO2 emissions will be possible, according to Ford’s statement at this week’s event in Amsterdam. The Fiesta EcoBoost Hybrid and Focus EcoBoost Hybrid will replace a standard alternator with a belt-driven integrated starter/generator (BISG) to enable the recovery and storage of energy usually lost during braking and coasting to charge a 48-volt lithium-ion air-cooled battery pack. The BISG also acts as a motor to provide torque assistance to the 1-litre three-cylinder petrol engine during normal driving and acceleration. Ford has targeted 112 g/km CO2 emissions and 57.6mpg fuel-efficiency for Fiesta EcoBoost Hybrid and 106 g/km CO2 emissions and 60mpg fuel-efficiency for the Focus. Ford’s plans to re-launch the Puma nameplate on the boot of an “SUV-inspired compact crossover” were revealed with a preview of the vehicle at this week’s ‘Go Further’ event. Claiming to fuse best-in-class luggage capacity of 456-litres and flexibility with a 155PS version of the brand’s new 48-volt mild-hybrid drivetrain, the new model is scheduled to go on sale at the end of this year. Rowley said: “Innovatively engineered and seductively styled, we think Puma is going to really resonate with compact-car customers in Europe.